Situated one block east of the Allen, steps from the Eglinton subway, serving Upper Village and Forest Hill, UPPER VILLAGE PAINT & WALLPAPER is an independently owned Benjamin Moore store catering to the paint and decor needs of residents, designers, painters and contractors, alike. We carry BENJAMIN MOORE's top products, including contractor Ultra Spec lines. Upper Village also features SICO's paint and primer product lines. Upper Village Paint & Wallpaper is also pleased to offer product and expert advice for CROWN Wallpaper, Cutek Extreme, SamaN and SIKKENS PROLUXE stains, TREMCLAD and COTTAGE PAINT. Well trained, personable and knowledgeable, our staff enjoys discovering client’s needs and guiding them toward colour choices and best practices. 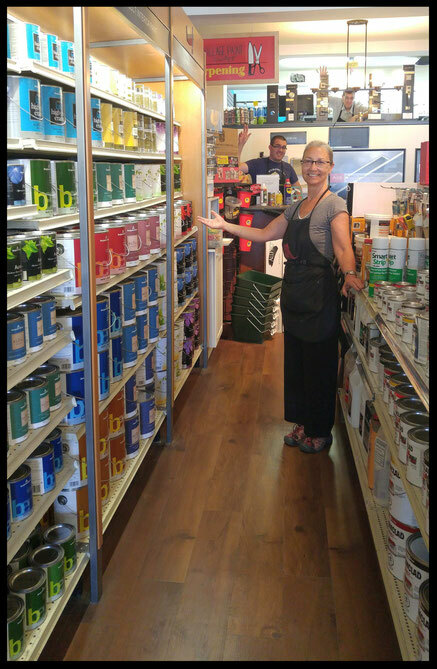 Upper Village is led by store manager Judith who has twenty years of experience in color consultation, paint and decor fields. Our shelves are stocked with painting supplies to support DIY-ers and contractors for any project. You will find premium brushes,rollers and trays (Corona, Nour); scrapers (Richard) and utility knives; sandpaper (Norton); spackling, glazing, crackshot, drydex, caulking (DAP); Dyna Patch Pro (Dynamic); wood fillers (Lepage, Timber Mate); wallpaper adhesives (ShurStik), all sorts of cleaners … and much more. More than paint, primer and stains, we offer additional local services for the convenience of customers. Key cutting, knife sharpening and window and screen repair is all part of our day at Upper Village Paint & Wallpaper. Last but not least, we feature premium hardware (Baldwin Reserve and Amerock). Come visit us to see the wide variety of handlesets, knobs and pulls available in popular finishes such as Satin Nickel, Venetian Bronze, Polished Chrome and Dark Bronze.